Only showing entries about wicked from Sustainable Travel. View entries about wicked from all Travellerspoint blogs. 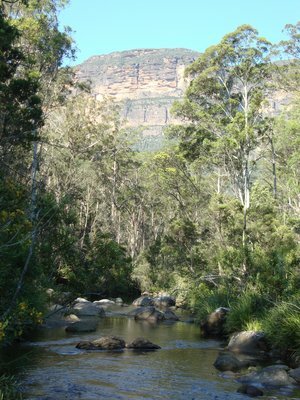 Hiking and camping in the Blue Mountains, New South Wales, Australia. Katoomba - Blackheath area. 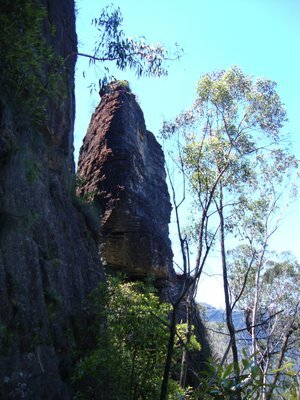 The Grose Valley. "You guys have plans for New Year’s yet?” Our French friends and fellow helpXers asked us this question and we shrugged our shoulders. “We are going to see the massive fireworks show in Sydney. Do you want to come?” We didn’t really care much about going back to the congested city to see some pretty lights. We kind of just wanted to enjoy the sunny weather and our days off. I find New Year’s celebrations to be highly overrated. You are in the Blue Mountains only once so we preferred to rather be hiking and camping in nature than be spending heaps of money on costly drinks . And that’s exactly what we did..
We were going to hike from Perry’s Lookout on one edge of the Grose Valley to Govett’s leap Lookout on the other side. We decided to split the hike up in two parts and camp overnight in the illustrious Blue Gum Forest. The hike itself actually only takes about 6 hours. But it’s an awfully steep descent from Perry’s Lookout and there’s only one site, Acacia Flats, for camping allowed along our planned route. It was also very grueling to hike back up. I got in trouble trying to achieve that last part. In my defense it was almost 35 Celsius outside and immensely sunny. 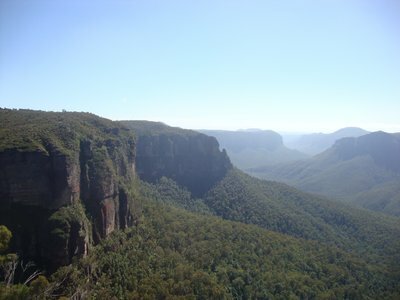 Once you get to one of the famous and very crowded, especially on sunny days, lookouts, you'll immediately understand why they call it the "Blue Mountains". The gum trees (different kinds of eucalyptus) show this characteristic blue haze that is not only to be found here in Australia of course. There’s lots of Blue Mountains throughout this world. I think that the blue haze probably has a scientific explanation that has nothing to do with gum trees in particular. But seriously.. how magnificently blue these mountains look. So we started the hike at Perry's Lookout after our lovely Helpx host dropped us off. Margaret really enjoyed showing us around and always offered to drop us off and pick us up anywhere in the area so we could go explore. This amazingly steeper than I thought downhill part had many astonishing views but my knees were starting to tremble a bit. Finally after about a full hour or two we got to The Blue Gum Forest. 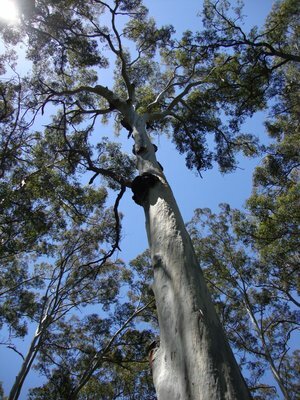 These towering eucalypti seemed to exude mystic vibrations. It is quite the spiritual hike through these magical trees. So after much admiration from us both we set up camp. There was an abundance of wildlife present. Especially the birds blew us away. We explored the area and found ourselves a giant flat rock in the middle of the Grose river to hang out on. Another animal that we encountered for the first time was the Mountain Dragon. They were everywhere and not shy at all. After snoozing on our rock, my husband woke me up and signaled me to keep still. Right there on an adjacent rock there was a Mountain Dragon, silently snoozing himself. He was quite huge and didn’t seem to mind us. By sunset time the forest really seemed to come alive. The most extraordinary colored birds came to take a dip or sip from the river, while singing their equally colorful songs. The only disappointment of the whole hike was the five lane wide ant highway that had formed itself across our tent diagonally. We had to fight some of those flying big ones off and moved the tent a bit further down. Problem solved. It did freak me out a bit though to be honest. The next morning we woke up bright and early and hiked further up the tracks to have breakfast at yet another beautiful spot on the river. Don’t forget to bring a water purifier or tablets, people! Fresh water is not always healthy to drink for us humans. The water in the valley for example was contaminated and we would have gotten sick if we didn’t have those tablets with us. 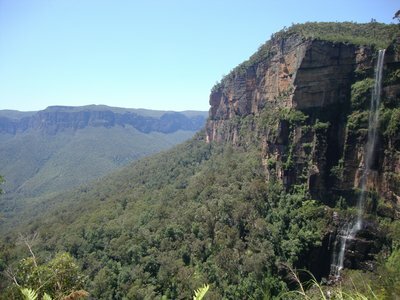 After about 4 hours off climbing up, first gradually then the irregular sometimes steep steps of Rodriguez Pass and eventually the steps up from Bridal Veil Falls to Govett’s Leap Lookout, we finally arrived at our destination. But not before we spotted two very rare Black Yellowtail Cockatoos. That made our day!! We’d heard so much about them. They’re supposedly worth 50.000 dollars each on the black market. I had to catch my breath for a while. It was after all extremely hot outside. Not a cloud in the sky. We made it up there by noon. Now, I blame it on the weather but all we could think about was to walk to downtown Blackheath and grab a pint in the local pub. And that’s exactly what we did.